Yet another beautiful day...a little misty in the early morning but bright and clear after breakfast. 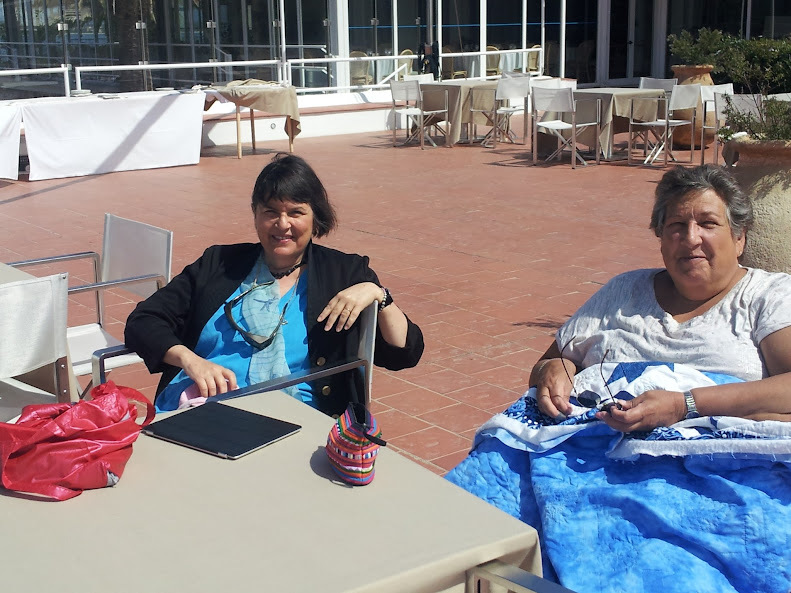 We take our time in the morning, packing (we have to leave this beautiful place today), doing a little work and quilting on the terrace in the sunshine. We check out of the hotel (but leave our luggage) and drive an hour south (on the same beautiful coastal road we drove on three days ago)...somehow driving in this direction is even more striking than in the opposite direction. The restaurant where we are going for Diana's pre-birthday celebratory lunch--da Riccardo--is located in a small village south of Bosa. Maureen and Franco have been there twice before and have memories of a delicious lobster dish. Unfortunately, they have no lobster this afternoon but we do have a great meal....three of us have the seafood antipasto featuring delicious octopus and potatoes and artichokes while Diana has the antipasto di terra--prosciutto, salami, etc. The pastas are all excellent....I have clams and the rest have some variation of pasta with bottarga (pressed mullet roe--a Sardinian specialty) and then we share two large grilled spigola (sea bass). The local white wine (a torbato) we have is very light and crisp. 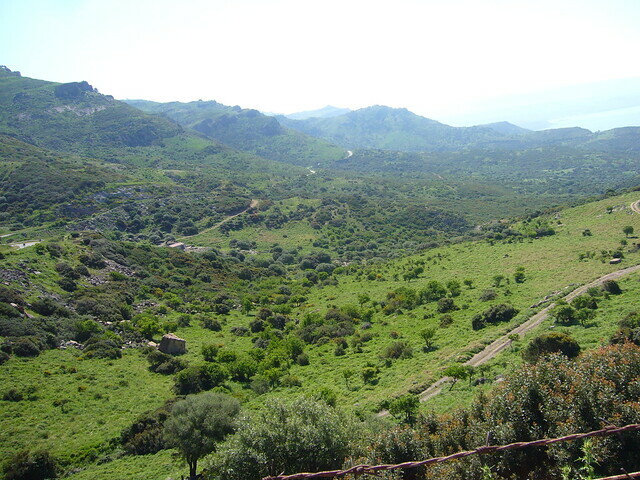 We then retrace our route back to the hotel, pick up our bags, say goodbye to Maureen and Franco at the airport and get on the road to Olbia--a two hour drive to the east side of the island--where we will get the ferry tomorrow back to the mainland. The drive is fine...we get to see a nice variety of Sardinian scenery--rolling hills, rugged mountains, lots of sheep--as we go from coast to coast. Once in Olbia, we have a problem locating our hotel..a Doubletree by Hilton (we are using points to stay there.) We can see the building but the GPS can't locate the street name and the signage is spotty. After cruising through back streets, we finally make the right turn and arrive. The Doubletree is a modern, American style hotel set in the middle of an undeveloped area of Olbia. It has an eight story high atrium with an elegant bar and large lobby area. The room is comfortable and bright, lots of electrical outlets, a spacious bathroom--we feel we are in some kind of time warp. We go to the restaurant which is large and empty. There is an elegant maitre d' who is very welcoming and three other staff waiting to take care of us but we only want something quick and light which we have. It's been a long day...the elevator takes us back to our room quickly. Tomorrow we get the ferry to Livorno....we have had a great time in Sardinia.